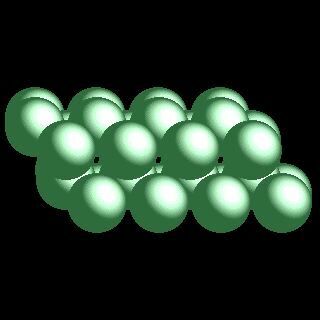 Beryllium atoms have 4 electrons and the shell structure is 2.2. The ground state electronic configuration of neutral beryllium is [He].2s2 and the term symbol of beryllium is 1S0. Beryllium: description Your user agent does not support the HTML5 Audio element. Beryllium is a Group 2 (IIA) element. It is a metal and has a high melting point. At ordinary temperatures, beryllium resists oxidation in air. Beryllium compounds are very toxic. Its ability to scratch glass is probably due to the formation of a thin layer of the oxide. Aquamarine and emerald are precious forms of the mineral beryl, [Be3Al2(SiO3)6]. Its chemistry is dominated by its tendency to lose an electron to form Be2+. As this ion is so small it is highly polarising, to the extent that its compounds are rather covalent. Its small size means that its complexes tend to be tetrahedral rahter than octahedral. The solid state structure of beryllium is: bcc (body-centred cubic). Beryllium has no biological role. In fact, compounds containing beryllium are poisonous. Reactions of beryllium as the element with air, water, halogens, acids, and bases where known. Binary compounds with halogens (known as halides), oxygen (known as oxides), hydrogen (known as hydrides), and other compounds of beryllium where known. Bond strengths; lattice energies of beryllium halides, hydrides, oxides (where known); and reduction potentials where known. Beryllium was discovered by Nicholas Louis Vauquelin (1763-1829) in 1797 at France. Origin of name: from the Greek word "beryllos" meaning "beryl". 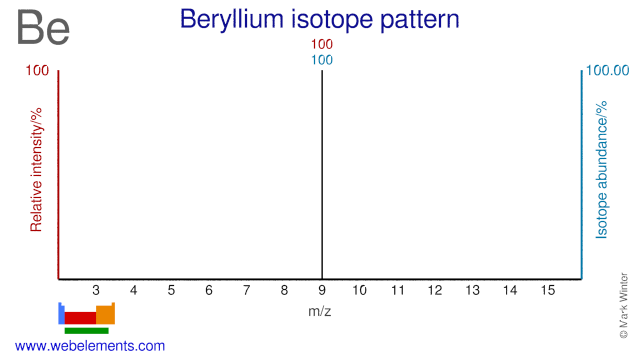 Isotope abundances of beryllium with the most intense signal set to 100%. Isolation: beryllium metal is available commercially and so would never normally be made in the laboratory. Its extraction from ores is complex. The mineral beryl, [Be3Al2(SiO3)6] is the most important source of beryllium. It is roasted with sodimu hexafluorosilicate, Na2SiF6, at 700°C to form beryllium fluoride. This is water soluble and the beryllium may be precipitated as the hydroxide Be(OH)2 by adjustment of the pH to 12. Pure beryllium may be obtained by electrolysis of molten BeCl2 containing some NaCl. The salt is added since the molten BeCl2 conducts very poorly. Another method involves the reduction of beryllium fluoride with magnesium at 1300°C.